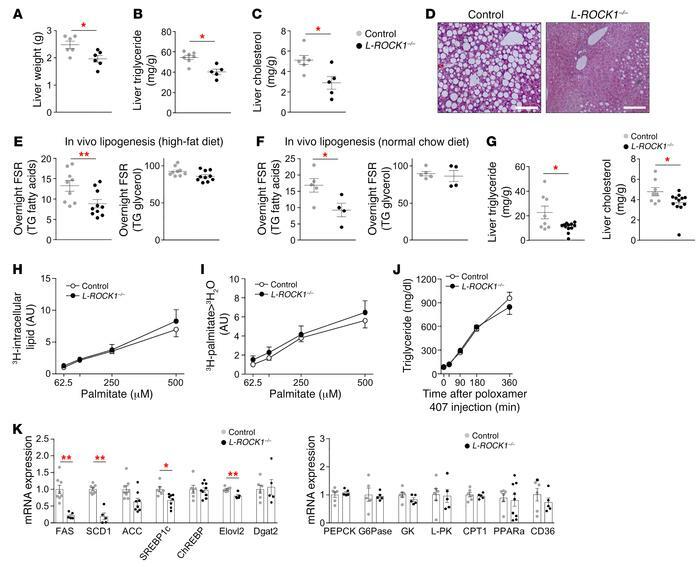 Loss of ROCK1 decreases hepatic lipid accumulation by reducing de novo lipogenesis. (A–E) Liver weight (A), liver triglycerides (B), liver cholesterol (C), H&E-stained liver sections (D), and in vivo fractional rate of triglycerides and glycerol in the liver (E) were measured in ROCK1loxP/loxP (control) and albumin-Cre;ROCK1loxP/loxP (L-ROCK1–/–) mice fed an HFD (n = 5−10 per group). Mice were fed an HFD from 6 weeks of age. Liver weight, liver triglycerides, and liver cholesterol were measured at 26 weeks of age. In vivo fractional rate of triglycerides and glycerol was measured from body weight–matched mice at 12 weeks of age. Scale bars: 100 μm. FSR, fractional synthesis rate. (F) In vivo fractional rate of triglycerides and glycerol in the liver were measured in control and L-ROCK1–/– mice fed a normal chow diet at 10–11 weeks of age (n = 4−5 per group). (G) Liver triglyceride and cholesterol content was measured in control and L-ROCK1–/– mice fed a normal chow diet at 18 weeks of age (n = 8−12 per group). (H and I) Fatty acid uptake (H) and fatty acid oxidation (I) were measured in isolated primary hepatocytes of body weight–matched control and L-ROCK1–/– mice fed an HFD at 12 weeks of age (n = 6 per group). (J) Serum triglyceride levels were measured after injection of poloxamer 407 solution in body weight–matched control and L-ROCK1–/– mice fed an HFD at 12 weeks of age (n = 7 per group). (K) Gene expression of key molecules involved in lipogenesis, gluconeogenesis, glycolysis, fatty acid oxidation, and uptake in the liver was measured by quantitative PCR in control and L-ROCK1–/– mice fed an HFD at 26 weeks of age (n = 5−8 per group). Values are means ± SEM. *P < 0.05 vs. control, **P < 0.01 vs. control by unpaired Student’s t test.